This book is free on Amazon on 4/14/2018! In an exclusive residential neighborhood, a U.S. Senator’s wife has died. Tommy Jacks and his fellow journalists don’t believe the police chief’s story blaming it on natural causes. It has the smell of a crime. So begins a new journey set in the 1960s involving numerous dead bodies, high-tension political intrigue, police corruption, the drug underworld and unsavory hidden pasts. Tommy has a lot to write about in his My View political column. Only in his second year as a political columnist, he finds new romance and emotional healing among a chaotic mixture of characters, from his new mother and his recently out-of-jail father to his acerbic journalistic mentor and antagonist and a foul-mouthed lawyer of questionable ethics, all wrapped inside the saga of two competing daily newspapers still at war. Lurking in the shadows is the powerful and corrupt police chief, who seems to think it might be best if Mister Jacks, even so young, was dead. 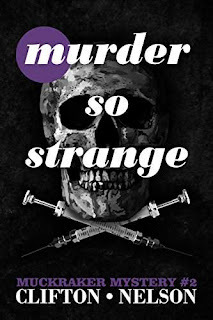 Murder So Strange continues the 1960s saga of Tommy Jacks: Muckraker.